A Fatal Fourway featuring Triple H, The Rock, Cactus Jack, and The Big Show headlined a unique WrestleMania 2000 show. The general thinking is that WrestleMania is the biggest show on the WWE calendar and, if not the best, at least the most ambitious show the company puts on each year. 2000 represented an oddball dynamic when, despite WWE running red hot, we wound up with quite arguably one of the weakest PPV efforts of the year at ‘Mania. The oddball card featured only one singles match (an abysmal “Catfight” between Terri Runnels and The Kat); otherwise, the several-way or cluster tag matches embodied the worst of WWE at the time—getting convoluted without good cause and wedging everyone onto the card at the expense of clarity and focus. This article takes a look back at the best and worst the show had to offer. The Hardys, Dudleys, and Edge and Christian made a huge statement. 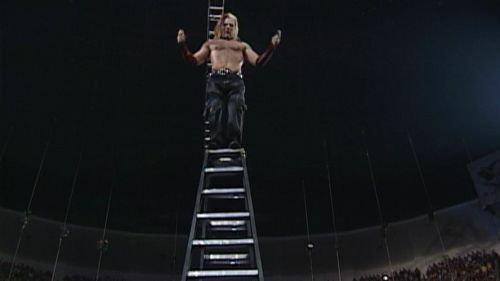 While much of WrestleMania 2000 was forgettable or actively bad, one of the truest bright spots was a Triangle Ladder Match for the Tag Team Team Championship, in which the Dudleys defended their titles against Edge and Christian and the Hardy Boyz. This was a prime example of these teams going all out to steal the show and prove their worth on a crowded roster. With a penchant for plunder and Jeff Hardy, in particular, defying gravity and fear with his breath-taking spots, this match established a foundation for the more famous TLC matches between these teams to follow. While there was little doing worse than The Kat vs. Terri Runnels, no one expected their match to be any good. When it comes to a WrestleMania main event, though, there is a certain minimum bar fans expect to be cleared. The Fatal Fourway between reigning WWE Champion Triple H, The Rock, Mick Foley, and The Big Show wasn’t all terrible in its overall execution, but it was a tough pill to swallow to see The Game retain his title. At that point, Triple H was WWE’s top heel, and he would become the first heel to ever close WrestleMania by winning the main event match and walking out the champion. While one could argue that this outcome fit with garnering heat for The Game, and particularly his relationship with the McMahon family, it also felt like WWE denying fans a feel-good moment just for the sake of a surprise. Triple H winning put a finer point on what many fans thought—that The Rock vs. Triple H should have been the one on one main event match, and all the more so that Rock should have gone over to more firmly cementing his status as the face of WWE in Steve Austin’s absence.